Braid your hair, not just a braid that goes straight back, but a side braid. 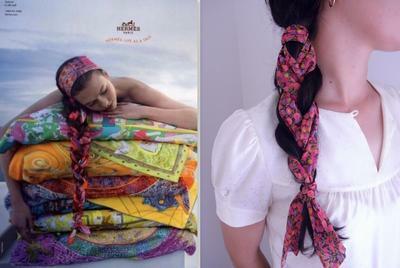 I normally use a thin scarf, tie it at the knot before beginning the braid and the two scarf ends should be braided in. It looks really nice and keeps your hair in place. What you should do with the top of your hair is side sweep your bangs and pin any fly aways. Another way to braid it is the Milkmaid Braid. Braid your hair into two ponytails, and then pin one across your head. You can put it as far back or forward as you like. Leave bangs or pin them back, then do the same with the other braid. Trust me it will look like it took you a while to do that but is really quite effortless ! When you wear your helmet make sure you wear a bandana and pin it to make sure your hair does not get messed up. And when you're at your destination, take the bandana off and now you can hairspray your hair :) You will need plenty of bobby pins.lol.